This model provides Guide to IRR and NPV evaluation methods of mutually exclusive projects. Project B with higher NPV than Project A. If I look at IRR method only, I would accept Project A because of higher IRR. 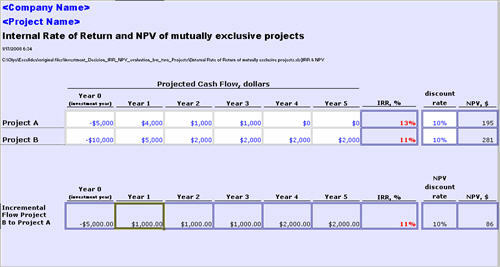 However, NPV shows that if I accept Project B I would receive more dollars. In this case, I need to look at IRR of incremental flows. I need to ask myself if it worth making additional investment in project B?. The model will provide clear step-by-step instruction on what requires your input in order to evaluate projects.